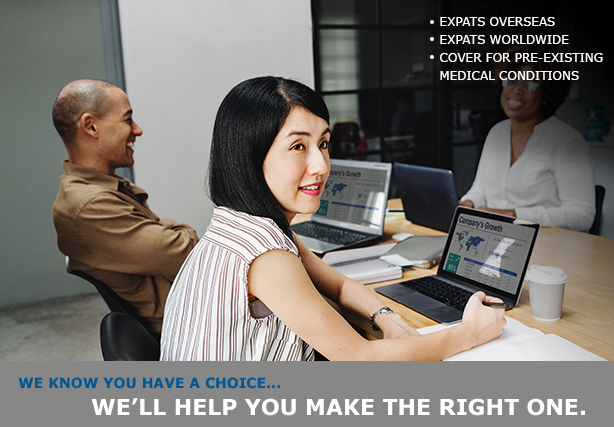 As a friendly team of dedicated international health insurance consultants committed to offering a quality range of expatriate healthcare plans, we pride ourselves on finding the plan that’s right for you, not the one which gives us the most financial incentive e.g. some expatriate health insurance plans are more suited to those reaching retirement age whilst others are better suited to younger applicants or those with families. Our company Directors have gained a wealth of knowledge as expatriates themselves and our customer service advisors are experienced insurance professionals, familiar with the perils and pitfalls of expatriates being under or uninsured. Our commitment to you is to always provide a first-class, efficient level of customer service, if you want to talk to us first, please call us now. Our approach, once we receive your enquiry form, is to review all of our international health insurance providers using the key data you have given us. We will then produce your individual personal quotation showing comparative quotes from different providers and highlighting the best value choices, or the one we think suits you best. Expatriate Insurance Services is Authorised and regulated by the Financial Conduct Authority (FCA) under license number 526928. Expatriate Insurance Services is a member of amii (Association of Medical Insurance Intermediaries). Expatriate Insurance Services is a member of BIBA (British Insurance Brokers Association).